Reviewing the history of our sacred traditions, it's clear that nondual spirituality is the most authentic, deepest form of mystical religion. Nonduality holds that ultimately there is only this One Divine Reality (call this God, Brahman, Ātma-Self, Buddha-Nature, Dao, Spirit, Awareness-Isness-Aliveness or whatever you like), with no fundamental, essential separation between God-and-world, God-and-soul, soul-and-world, or soul-and-soul. This Unborn, Infinite-Eternal Divine Reality is in fact YOUR REAL SELF and EVERYONE'S REAL SELF... the True Self of all selves.... Right HERE (closer than the mind, closer than the eyeballs, closer than close) and right NOW (before one can even think about THIS Self). You cannot and need not make an object, a perceptible or knowable "thing" out of THIS FORMLESS SELF, just as the fingertip need not touch itself and the eyeball need not see itself to function splendidly. You simply and non-objectively ARE the Nondual Self, no need to make an object-like "thing" out of your essential "no-thing-ness" Nature as the Source of all things, beings, processes. You are Open, Absolute Awareness. On the relative, functional, pragmatic level, we make useful "dualistic" distinctions between you and i, him and her, helpful and harmful, justice and injustice, etc., but on the absolute level of WHAT REALLY IS, realized through the most sublimely profound Divine Intuition (our authentic Knowing-by-Being), we find no dualism, separation or alienation, only THIS ONE (NONDUAL) REALITY. This Absolute Being or Open Awareness has no "rival reality" that can compete or interfere with or occlude This Supreme Truth... so, to repeat, this Reality is YOUR TRUE REALITY right HERE, right NOW. Even the so-called "ego-mind" cannot interfere with or diminish WHAT YOU ALWAYS ARE: the Open Awareness, Changeless Isness or Groundless Ground in which everything happens—minds, bodies, worlds. Hence, anyone who sincerely explores the timeless self-inquiry, "Who am I?" or "What are we? "—will discover the unspeakable wonder and beauty of Who is really here and What we really are: infinite Spirit poignantly including and permeating (not trapped inside) a finite body-mind-soul or personality. Our Real Nature is Unlimited Being manifesting the "dream" of limited experience as a human being. By Divine Grace, we find, as all true mystics worldwide have found in opening up to nondual spirituality, that Pure Awareness or Spirit, prior to the rise of the egocentric "me," is the supra-personal or transpersonal One transcending yet permeating this personality. This is to awaken from the plight of selfishness to the Reality of Self-Fullness. It is to "lose one's life" for Eternal Life, as Jesus invited. Or, as Paul said, to know that "in Him [this Divine "I Am That Am" Self] everyone lives, moves and has their being." In short, THIS One Reality, Self or Awareness is Who we really ARE, and Who everyone really IS. In the Divine Party of One Pure Bliss, we love, cherish and celebrate this transcendent Single Self immanently within all selves. "The Ātman (Absolute Self) alone is to be meditated upon, for in It all are one… By It one knows all this…. Whoever knows thus, 'I am Brahman/Reality' becomes this all. Even the gods cannot prevent his becoming thus, for he becomes their Self…. This Divine Self is a world for all beings—gods, seers, ancestors, humans, livestock, and tinier creatures…. All the vital breaths/energies, all worlds, all gods, and all beings spring from this Ātman. Its inner meaning (upaniṣad) is 'the Real behind the real, or Truth of truth. '… When there is some other thing, then one can see the other, smell… taste… greet… hear… ponder… touch… perceive the other. [But in Self-realization] one becomes the single ocean, the nondual Seer. This is the Brahman Reality…. This is the highest goal, the highest treasure, the highest world, the greatest bliss…. A verse says: 'When all desires dwelling in the heart are banished, then a mortal becomes immortal; he becomes Brahman here (in this life). '… Knowing that immortal Brahman, I am immortal. Those who know the life behind breathing, the eye behind seeing, the ear behind hearing, the mind behind thinking, have realized the ancient, primordial Brahman. With the (intuitive) mind alone must one realize It. In It there's no diversity; one goes from death to death seeing diversity in It. This un-showable, constant Being can be realized as One only. The Self is taintless, beyond space, unborn, vast, and immovable. Let a wise aspirant directly realize this insight, not just reflect on tiresome words." 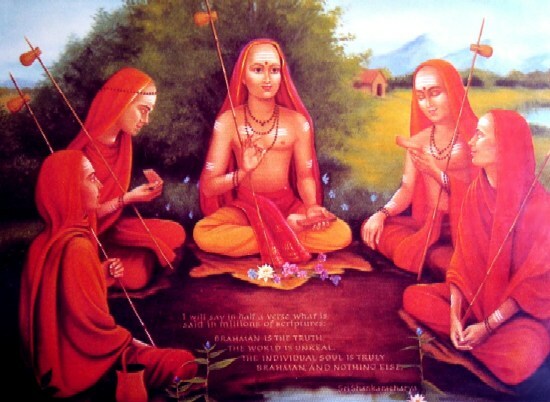 The eminent sage Śaṅkara, who revived India's Advaita (nondual) Vedānta movement in Hindu India around 650-700 C.E., shown here with his fellow itinerant disciples. The caption quotes two famous lines attributed to Śaṅkara: first, "I will say in half a verse what is said in millions of scriptures," and second, "Brahman (Absolute Reality) is the Truth; / the world is unreal (only relatively, experientially real). / The individual soul is really/truly Brahman and nothing else" (Brahma satyam, jagan mithyā, jīvo brahmaiva nā parah) (The latter line is from the Brahmajñānāvalī Mālā, verse 20, where this is touted as "the correct understanding proclaimed by Vedānta"). Elsewhere, Śaṅkara would sometimes repeat the ancient Chāndogya Upaniṣad utterance (iii.14.1), "Brahman is all this (manifest worlds and beings)" (sarvam khalvidam Brahma) and he clarified that "world as world is unreal; world as Brahman is real." Nondual spirituality reveals a truly "foundational" Absolute Reality that explodes the post-modernist claim dominating our colleges, universities and halls of academia (and castigated by Huston Smith, Robert Forman, and Ken Wilber), the claim that there is no such Reality, only "cultural conditioning," "wishful thinking," and "language games." Here we would also briefly mention the serious limitations of the controversial "neo-advaita" or "neo-satsang" movement that has infiltrated much of the USA, Europe, Australia and India the last dozen years (now called "pseudo-advaita" by some persons formerly hailing the advent of neo-advaita). We will have more to say about this in some of the essays linked much further below. Neo-advaita, which attempts to articulate nondual spirituality, and often does a very good job of presenting some of the traditional advaita teachings (though usually, it seems, quite ignorant of the specific ancient sources for these teachings), can be fairly summed up by its main teaching: "Call off the search, You are already the Self, no need to seek for It." Now, traditional Advaita—as articulated by authentic sages from Yajñavalkya to Shankara to Ramana Mahârshi in Hindu Vedânta—along with real nondual spirituality in all our genuine "pure mysticism" traditions, also would have one abandon any neurotic, selfish seeking for a desirable goal-state for "me." But the obvious limitation of neo-advaita is that it tends to completely ignore the "ego-free holy aspiration" for real Divine expression that ensues for the true sages and saints once selfish seeking drops off in initial levels of awakening. Just to merely have "the Understanding" (as some have made a fetish out of it) that "only the Self is Real," or that "Consciousness is all there is" and think that there is nothing more to spirituality than this conceptual understanding and a corresponding "blanked-out" zombie demeanor is simply not sufficient for authentic awakening from the selfish "me-dream." In an analogy, we can say that it is certainly true on one level that the little sapling is in some "potential" sense a tree, destined to grow into one if conditions are right. But the sapling is not yet fully functioning and serving as a full-grown tree, capable of providing shade, fruit, flowers, medicinal herbs from its bark, etc. In the same way, all sentient beings truly have the Divine Atma-Self as their real Identity. But are they maturely functioning and fully serving as the Self? Are they really manifesting the Divine virtues of self-sacrificing compassion, generosity, empathy, goodness, kindness, and all-embracing love that we find in the true spiritual masters? Or are they still plagued by egotism in various subtle or not-so-subtle fashion, but rationalizing and justifying all such egocentricity as "God's will"? Recall Jesus' great criterion for genuine spirituality: "By their fruits ye shall know them." Awaken God-Self! A Message from Awareness to ItSelf --an even shorter, more poetic and whimsical expression of the same quintessential mystic wisdom. Panentheism -- also known as Absolute Theism, panentheism ("All in God, God in all") is the 19th-century term, becoming increasingly important in theology and science, referring to the very sublime, balanced and nondual theology of the world's greatest spiritual mystics/masters. In panentheism (no mere pantheism or dualistic theism), the Divine One is fully transcendent yet fully immanent, beyond all beings yet within all beings. This essay clarifies important aspects of the topic. Questions & Answers on Nondual Spiritual Awakening --Here are responses to commonly asked questions asked of me over the last two decades in satsang-gatherings, spiritual counseling sessions, and classes. I have also reproduced here some verbatim email interactions with actual correspondents: spiritual aspirants with a healthy range of questions and concerns on how to authentically live a profoundly realized spirituality. Varieties of Nondual Realization--a free-wheeling survey of what I consider to be the most important 14 domains or aspects of nonduality, all needing to be honored for a fully balanced spirituality. 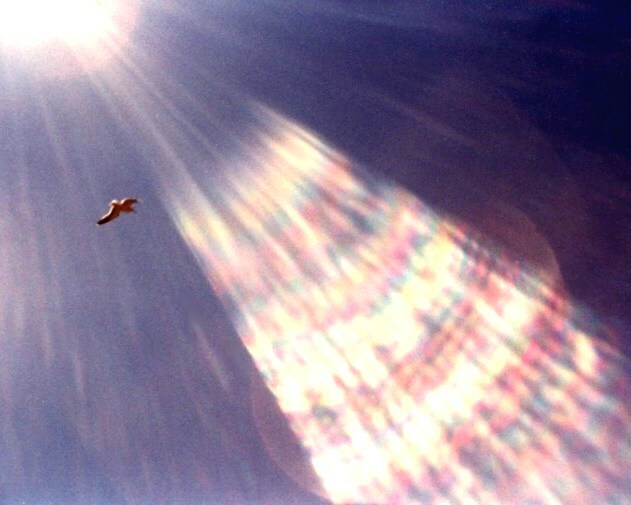 Nondual Awakening, Its Source and Applications--a four-part paper appearing in a 2007 book for mental health professionals who have begun to integrate the nondual perspective into their work. That book, Listening from the Heart of Silence: Nondual Wisdom and Psychotherapy, edited by my longtime friend John Prendergast with G. Kenneth Bradford (Paragon House, June 2007), is available for purchase through amazon.com and other booksellers. One and Many --another somewhat playful presentation of a long list of terms and concepts from our Great Traditions to usefully and paradoxically distinguish the primordial polarity-within-nonduality, namely, the distinction between the One and many, the Absolute and the relative, the Noumenon and phenomena, Self and selves, Awareness and objects of awareness, Shiva and Shakti, Emptiness and Form (etc.). There is a useful explanation at the bottom of this particular webpage on what it is to live this polarity-within-nonduality. Freedom from Binding Ego-Tendencies --a clarification of what spiritual liberation or awakening really means, operationally speaking, in its most crucial dimension; an important corrective to our modern era's "neo-Advaitin" over-emphasis on mystical awakening in merely cognitive terms as just a special kind of "knowing" or "understanding." The Three Simultaneously-True Levels of Nondual Reality --this very useful model allows us to integrate all levels of our experience, the conventional mundane level (e.g., right-wrong, skillful-unskillful, justice-injustice), the epiphanic soulful level ("everything is perfect," all are coming Home to God), and the ultimate or Absolute level ("nothing is really happening," Only GOD-AWARENESS). Not being able to account for all three levels or aspects of Reality usually produces some kind of spiritual imbalance. Nondual Wisdom and Devotion --an old paper written in in Fall, 1979 upon entering graduate school at the California Institute of Integral Studies (CIIS, then known as the Cal. Institute of Asian Studies, CIAS). This paper addresses the longstanding dialectic between the spiritual paths of wisdom and devotion, what in Hindu Vedanta tradition are termed the paths (mārgas) of jñāna and bhakti. Clearly, the attention in the mature phases of both paths actually works very much in the same way: intuiting a profound Subject-ive Presence (the "I" that is "You," the "You" that is "I"). --Incidentally, I've uploaded this paper and a few other things at our website in pdf file format. Your computer likely already has Adobe Acrobat Reader installed on it for viewing or printing these PDF files, and will automatically use Acrobat when you click on the link, but if your computer lacks Acrobat, the program can be freely and quickly downloaded at different places on the Internet, starting here. Philosophy & Psychology, East & West --one more paper from grad school, Winter 1980, a long survey (in PDF format) covering all the Perennial Wisdom traditions save Christianity, addressing the issue of dis-identifying from the false self and awakening to True Identity, beginning with the Hindu traditions and culminating with the Sufi mystic traditions. This Is All A Dream --yet another old essay written at CIIS (fortunate to win first prize in the 1983 Kern Foundation Essay Contest), presenting the teaching from our Perennial Wisdom Great Traditions that the waking state's manifestation of a world is a wondrous dream. Among other things here are some great quotes from Meher Bābā, Nisargadatta Mahārāj, Ramana Mahārshi, Tripura Rahasya, the Yoga Vāsiṣṭha, some favorite Zen and Sufi masters, western philosophers and scientists. The presentation here is from an advaitin viewpoint of "being responsible" within the dream, not a neo-advaitin viewpoint of "irresponsibility." Jñāneśvar --a very short introduction to the life and work of the amazing 13th century yogi-sage-mystic-poet-philosopher, Srī Jñāneśvar or Jñānadev (c.1275-1296), with excerpts from his letter of friendship to Changadev, one of the most significant gems ever written on God and sacred relationship. Bhagavān Śrī Ramana Mahārshi (1879-1950), Self-Abidance, and the Way of "Who Am I?" --this was for years the principal website on the towering advaita sage of the 20th century, widely beloved as Bhagavān, Lord, seen by many as a Divine Incarnation of wisdom; also a great parabhakta or nondually-oriented devotee of the One Self in all. Ramana is still available to sincere aspirants in visions and dreams, but chiefly available as your very own formless Self! This is a link to Graham Boyd's website. For the current official Sri Ramanasramam website, click here. Another really excellent and comprehensive website on Bhagavan Sri Ramana Maharshi is longtime Ramana author and researcher David Godman's Bhagavan, His Life and Teachings. Śrī Nisargadatta Mahārāj (1897-1981) --Bombay's fiery sage of supremely liberating wisdom, the most renowned teacher of advaita nonduality in India's latter 20th century. Here are several great photos of the Maharaj's physical form (truly, he is/was bodiless! ), a long inspiring biography (with numerous under-reported facts about the man), several people's accounts of meeting the sage (including my linked page of diary-notes and tape-transcripts), and the Maharaj's extensive teachings, including some devotional lyrics, the free online book I Am the Absolute, and Carrasco's 80 pages of excerpts from the classic text, I Am That: Conversations with Sri Nisargadatta Maharaj. I've also linked my long, multi-facted essay on Nisargadatta's importance for those in the healing professions. Therefore, the materials on Maharaj at this webpage or linked from it comprise one of the most inclusive and informative "books" on Nisargadatta Maharaj on the entire Internet or in print. My Foreword to the 2015 book Selfless Self - Talks with Shri Ramakant Maharaj -- This Foreword, written at the invitation of editor Ann Shaw for the 1st, larger edition of the book, discusses different aspects of nondual spirituality and highly recommends this book of talks with an Indian disciple of Sri Nisargadatta Maharaj: Śrī Rāmakant Mahārāj (1941-2018). Rāmakant emerged as a sage in his later years, having spent 19 years as a young family-man with Sri Nisargadatta. For more than a dozen years until his passing he daily taught his own followers and visitors the way of direct, sudden awakening to Self with highly effective "Truth-hammerings" at a small ashram in Nasik (in India's Maharashtra State). Meher Bābā (1894-1969) --This link connects to another veritable book i've compiled, featuring Meher Baba. Read a detailed chronology of his dramatic life, an in-depth assessment of his unique personality and methods of working with disciples, and a very long collection (circa 80 printed pages) of his wonderful nondual teachings on Divine Realization. Baba seems to be relatively unknown to the present generation of advaita-enthusiasts, but he was issuing profound expressions of nonduality from the 1920s onward. Dadaji of Calcutta (c.1910-92) --Ann Mills' generous website on the amazingly mind-blowing, wonderfully heart-opening Dadaji ("Elder Brother") Amiya Roy Chowdhury of Calcutta, with free downloads of books and booklets on this master of nondual devotion and wisdom, a veritable Incarnation of Love whose life abounded with miraculous events, and who deserves to be much more widely known. Film Review of "Gurukulam" on Swami Dayananda -- I was requested by the filmmakers in 2014 to review their lovely 2013 film about the Gurukulam ashram in South India and its head, the late Swami Dayananda Saraswati (1930-2015), a talented teacher of text-based Advaita Vedanta, who in 1982 established his own organization independent of the widespread Chinmaya Mission (founded in 1953 by Swami Chinmayananda) that Dayananda was groomed to head. The film, as my review explains, has a nice egalitarian focus on all the key players involved with the activities of this peaceful Gurukulam ashram. Zen Humor Wisdom Page --for some time this long Zen humor page was linked only through the Spiritual Humor webpage; but it deserves to be linked here for the wonderfully witty and profound nondual wisdom from our ancient friends in the Ch'an tradition in China, Zen in Japan, Son in Korea. And check out those delightfully whimsical Zen paintings! Bankei Yōtaku (1622-93), Zen Master of the "Unborn"--profiles the interesting life and amazingly direct, potent wisdom-teaching of one of the most impressive Japanese Zen masters of the last half millennium, widely famed for his direct-intuitive pointer to "stay unborn (fu-shō)!" Evidently many thousands of Japanese people, not just monastics, became authentically liberated into a beautifully unburdened and wholesome, virtuous life by realizing the Unborn Buddha-nature through Bankei's clear, simple instructions. John Scottus Eriugena--reveals the stunning nondual view of arguably Christianity's finest, subtlest theologian who ever lived (along with Meister Eckhart and St. John of the Cross--who were much influenced by Eriugena; see Religion & Spirituality section of this website). Eriugena's nonduality, drawing primarily from early Greek Christian sources, is explicit, full-blown, and an amazingly positive vision of what Christianity could be, right in the middle of Europe's 9th-century "Dark Ages." Deconstructive Inquiry into Negative Self-Judgments --an insightful and useful expansion, by dear friend John Prendergast, of The Work, popularly originated by Byron Katie. This can help anyone, especially therapists and their clients, to release negative self-judgments and open up to the spacious Awareness that is our Real Nature or True Identity. Inner-Quest.org website--this excellent website run by some advaita friends in France (with ample English section) has a wealth of material on various modern-era jñāni-sages of India, including one of my own mentors, Śrī Nisargadatta Mahārāj, as well as Śrī Rañjit Mahārāj, Harilal Poonja (Papaji), and many others. Advaita, ethics, authentic and inauthentic sages --Here are various materials about the controversy that erupted in early 2005 over my old friend Ramesh Balsekar, one of the primary exponents of neo- or pseudo-advaita. This long webpage includes two essays I wrote on the topic of Advaita and ethics and "the 4 kinds of authentic and inauthentic spiritual teachers." These letters (general excerpts from which are linked below as a stand-alone two-part essay) could just as easily have been included at our "Healthy Spirituality" section. The same could be said of my and others' detailed critique of Adi Da (Franklin Jones) and critiques of Osho Rajneesh and Bhagavan Kalki and his Deeksha Oneness Movement as well as the very critical response letters about Sathya Sai Baba that I wrote as open communications to his ardent devotees, concerning the documented allegations of his sexual molestation of minors and other serious violations of Dharma (Virtue, Righteousness). In the cases of Ramesh and these four very problematic "God-men," Ādi Da, Rajneesh/Osho, Kalki, and Sathya Sāī Bābā, there is tragic confusion betrayed by them and by their devotees over Real Advaita (which upholds a functional distinction between the "Two truth levels"--Absolute level and conventional-moral level) and pseudo-Advaita (which blurs these two truth-levels for rationalizing and excusing their dysfunctional, exploitative, unaccountable behavior). Neo-Advaita or Pseudo-Advaita and Real Advaita is an even more extensive clarification of the "two truth levels" and how in various ways this is distorted and prostituted by those in the new-wave camp of depersonalizing, apathy-promoting, unhealthily absolutizing "pseudo-advaitins" ☺ I've added some things here that others have had to say about this rampant "Advaita Disease." I've followed this with a long piece assessing the positive and not-so-positive aspects of the modern-era sage Papaji (Harilal Poonja). This is followed by a critique and discussion of the charging of money that goes on in most neo-advaita circles. The last part of this long web-page features a discussion (with friend Nirmala) of the current and future state of advaita instruction in the West. I was asked a few years ago to write up a comment on the uni-level neo-advaita teachings of Tony Parsons, which turned into a mini-essay that can be read here. Four Kinds of Spiritual Teachers: More on Advaita & Ethics --An essay distinguishing 1) the authentically liberated and profoundly enlightened sages who are overtly helpful toward disciples; 2) the authentically free if quite eccentric God-mad "holy fools"; 3) the really helpful if not "fully enlightened" good spiritual friends; and 4) the pretenders or pseudo-sages. Appended to this are excerpts from another essay on the financial and sexual exploitation commonly found among the pretenders. A Brief Critical Analysis of A Course in Miracles, ACIM--I don't consider ACIM to be dangerously imbalancing or subversive, but i do see that it merits some criticism for its dualist-sounding theology, its humorless pomposity, and its narrow-mindedness (students are recommended by the ACIM text to only study ACIM). So here's a brief critique of the movement that took over many Unity churches from the late 1970s onward, to the chagrin of many Unity ministers themselves. Douglas Harding and the Simple Way of No-thing-like Headlessness--a brief introduction to and autobiographical excerpt from a classic text on nondual spiritual realization, On Having No Head, by my dear old friend, the eminent British mystic Douglas Harding (1909-2007), a rare spiritual genius who freely helped make the realization of Pure Awareness so easily accessible, live-able, and delightful by simply pointing back to the vast, invisible Open No-thingness from which we all see, hear, feel, think and be. Follow the link to the website on Douglas created by Richard Lang at www.headless.org and check out Douglas' amazing "experiments" in the "Science of the 1st Person" to discover Who You Really Are. India's Sages: Nondual Wisdom from the Heart of Freedom (modern era) and India's Sages: Nondual Wisdom from Hindus, Buddhist, Jainas, Tantrics, Sants, Sikhs and Sufis (past eras)—these are my forthcoming two books on dearly beloved sages including the Buddha, Nagarjuna, Sankara, Jnaneshvar, Kabir, Ramana Maharshi, Nisargadatta Maharaj, Dadaji and over 150 other sages of nondual devotion and wisdom. Again, a reminder that a number of our greatest "nondual" sages (Lao Tzu, Chuang Tzu, Jesus [in the Thomas and John Gospels], Meister Eckhart, Bayazid Bistami, Hakim Sana'i, Moshe Cordovero, et al.) are already featured in the Religion and Spirituality section at this website.